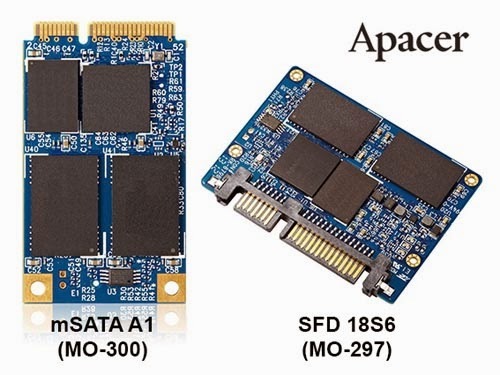 To answer the needs in the industrial mobility device trends, Apacer launches two ultra slim SSDs: JEDEC MO-297-compliant SFD 18S6 and MO-300-compliant mSATA A1. The small size equipped with SATA 3.0 high-speed transmission interface, along with the products’ features of low power consumption, durability and high performance, will become the necessary storage solution for the rise of the new mobility devices. It can be specially applied to medical tablet PCs, bedside healthcare, mobile on-board unit and data communication system devices. These two products adopt solutions with new process technology, so the power consumption during idle mode is significantly reduced by more than 50%, compared with their predecessor. Supporting DEVSLP (Device Sleep) signaling protocol, they can enter the low power state while in standby, effectively saving power. keep them coming para maging affordable na mga SSD. they should include the price for the Apacer SSD. sana hindi masyadong mahal. can anybody tell if this came in case or just a barebone SSD? of course there is a case. the only thing we need to know is the price.